The Alcatel 3T 8 tablet is available at a price of Rs 9,999 on Flipkart and is powered by Android 8.1 Oreo and packs a 4080 mAH battery. 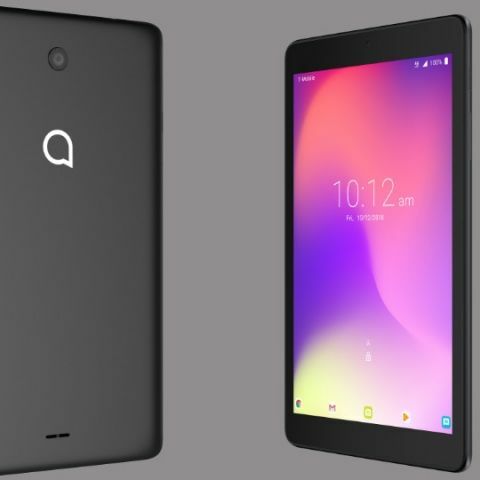 Alcatel has launched its 3T 8 tablet in partnership with Flipkart and is available at a price of Rs 9,999. It is powered by Android 8.1 Oreo and packs 4080 mAH battery. It comes with Parental control and special kids mode. TCL Communication launched its premium Alcatel 3T 8 tablet in the Indian market exclusively with Flipkart on Big Billion Day Sale. Staying true to its tagline Slim design with Smooth Experience, Alcatel 3T 8 offers users captivating 8.2mm thickness and lightweight at 279 grams. Equipped with the latest operating system AndroidTM OreoTM edition boasts of 2x faster boot time for featureless multitasking. Alcatel 3T 8 has created buzz among Alcatel followers for its premium design and smooth experience. Victory over the series of the successful launch of the other products, Alcatel continues to make waves in the Indian market. Captaviting slim at 8.2mm thickness and lightweight at 279 grams, Alcatel 3T 8 is the ideal accompaniment when you're on the go. It comes in metallic black and suede blue finish. Around the clock connection and a flowing user experience is yours with the Alcatel 3T 8. Enjoy a smooth hassle free 4G calling experience with VoLTE and ViLTE. A powerful 4080mAh battery, Android™ Oreo™and has been through thorough stability tests. It is powered with 3GB RAM and 32GB ROM expandable upto 128GB. Capture stunning 1080p video at 30 fps with the 8MP rear camera. And a 5MP front camera for gorgeous selfies. Breathe vivid accurate details onto your images and videos with the HDR mode. Now enjoy extended periods of smartphone viewing without fatigue, using the exclusive Eye care mode. Alcatel 3T 8's exclusive feature ensures reduction of blue light and provides the best brightness and tonality for all-day usage, especially under low light. Use Entertainment mode with crystal clear streaming at 1280x800 HD for an immersive viewing experience. Get an enriched audio experience across multiple audio formats such as MP3, PCM/WAVE, AAC, AAC+, MIDI, VORBIS and more. Power your ringtones, multimedia, and gaming experience with in-built speaker.